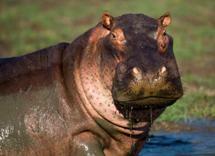 The final already-established walking safari based in Zambia is that operated by Remote Africa safaris. Here they operate the Chikoko Trails Camps, which are comprised of two private bush camps: Chikoko Tree Camp and Crocodile River Camp, as shown below. The plan is to spend your first two nights at Remote Africa’s base camp, Tafika, where you can enjoy some excellent game viewing by vehicle, and also take to your feet in the bush in readiness for the walking safari to follow. This stay is then followed by two nights each at Crocodile River and Chikoko, before ending up with a final night again at Tafika. The journey from Tafika is undertaken partly by vehicle, but then all luggage and supplies have to be portered into the camps themselves. Here you will walk from camp to camp in the remote area of South Luangwa that these camps occupy, following the animal footpaths and discovering the inner workings of the African bush as the expert Remote African Safaris' guides share their experience and wilderness knowledge. 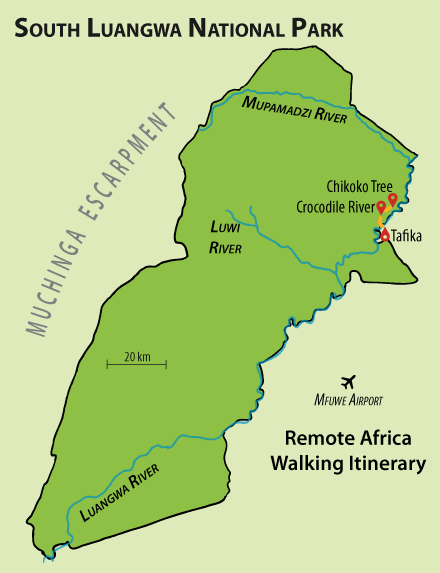 The route follows the well-worn elephant and hippo trails and – of particular interest – follows the original footsteps of David Livingstone, through the Luangwa Valley. 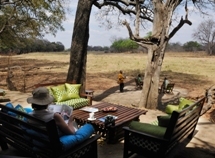 Days Five to Eight of the first Zambian itinerary described in our www.SafariDiary.com website will give you a more detailed insight into what to expect here. Incidentally, Remote Africa Safaris also operate one of the few bush camps in the North Luangwa National Park - Mwaleshi Camp. 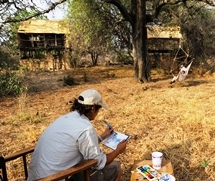 It is therefore possible to put together a quite spectacular walking experience, by combining the itinerary described here with a further one such, based in North Luangwa - see The AfricaAway North Luangwa Walking Safari page for more details. 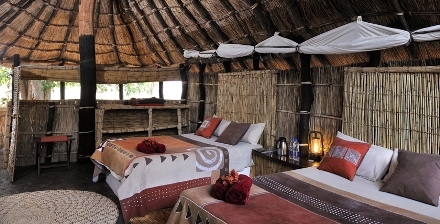 The cost of the above itinerary, based on two nights at Tafika, two nights each at the Crocodile River and Chikoko Tree Camps, together with a final night at Tafika is $5460 per person in high season. This is an example only: the actual trip could be longer or shorter. The Remote Africa website also offers video links describing their features and activities.